Whoever would have thought that some people once called economics the most dismal of sciences? Certainly, as the current crisis goes on and on, those of us who consider ourselves to be economists scarcely are able to find the time to squeeze in a dull moment, even here and there. 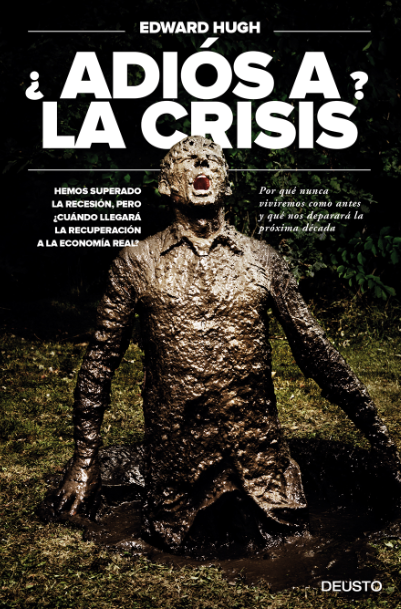 But even at a broader level, interest in that most dismal of dismal topics - the theory and practice of central banking - seems now to fire up levels of enthusiasm here in Spain that make even the appetising prospect of a forthcoming Real Madrid-Barça football match pale in intensity. Even if it is the case, I have to admit, that the everyday Johnny (or Jill) come lately sitting in the bar still - truth be told - prefers the sports columns of the daily newspapers, or the lacivious details of the latest romantic adventure of one of the rich and famous to a careful perusal of the detailed minutes of the last policy rate setting meeting over at the central bank. The reason for the sudden and unexpected upsurge in interest should, I would have thought, be obvious - since with over 85% of Spanish mortgages being variable (and thus determined by the ECB policy rate), and Spain's economy sinking into an ever deeper pit, the impact of the coming decisions (or even the hints at possible future decisions) have entered peoples lives like never before. And this is doubly the case in an environment where - as Bloomberg inform us this morning - central bankers from across the global, from Washington, to Sydney, to Oslo are likely to take increasing account of future accelerations in asset prices in an attempt to avoid repeating policy mistakes that are presumed to have inflated two speculative bubbles in a decade, culminating in the worst financial crisis since the Great Depression. By way of illustration for their feature story the Blomberg reporters single out the prime example cases of Norway and Australia, countries whose recent stronger than average inflation and growth performance is now so well known to regular investors for the mention of their name in such reports to have become a mere commonplace, with the respective currencies being eagery purchased to the sound of hearty lipsmaking at the thought of all the juicy carry which lies ahead. Personally though, had I been doing the writing, I would have chosen a rather different example, one much nearer to the heart of Europe (and thus a little closer to my own) - France. And why France you may ask? Well quite simply because the French economy is now plainly and evidently on the mend. That is the big, big news which can be gleaned from last Friday's Flash Markit PMI readings. 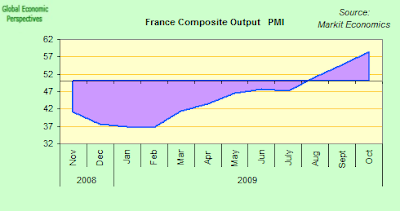 What stands out in this PMI months data is the performance of the French economy. The output Index, based on a sample of around 85% of normal monthly survey replies, indicated that growth of the French private sector was strongly sustained in October, and into a third successive month. Climbing to 58.4, from 54.8 in September, the headline index indicated that growth accelerated markedly to reach its steepest in nearly three years. Both the manufacturing and services sectors were strongly up - manufacturing output increased for a fourth successive month and at 55.3 (from 53.0 in September) expanded at the steepest pace since May 2006. Services activity also rose well and at a level of 57.8 put in its best performance since February 2008. This Time France, Not Spain, Is Different, But Is It Really A Case Of Vive La Difference? So French industrial production has been steadily recovering in recent months and the latest business surveys show this should continue, even if activity is still significantly (12%, much less than many other euro area countries) below its pre-crisis level. Consumer confidence has been steadily rising for over a year - even if, again, it continues to be weak by historic standards. 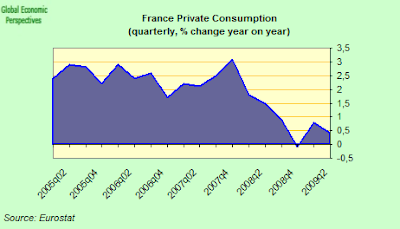 Household consumption has also been rising, and in fact remained positive on an annual basis throughout the crisis (see chart below), and even if the potential for substantial further acceleration seems limited, this is still the key difference between France - where there is sufficient autonomous domestic demand left for the stimulus package to work - and the other euro area economies. In fact this seemingly unexpected leap into poll position hardly comes as a surprise to me, since I have long been arguing that the French economy would emerge as the strongest among the EU economies from the present deep recession, and some justification for this view can be found in this post here, while an earlier piece from Claus Vistesen in 2006 also gives an illustration of how we might think about the problem. So one epoch ends, and another begins, inauspicious as the beginnings may be. And there is both good and bad news here, since this early and isolated recovery in France is bound to create difficulties of the "exit thinking" kind for policymakers over at the ECB. The most pressing of the problems will concern what to do about containing French inflation if exit dependency in Germany means that a full recovery there remains out of reach, while Italy languishes where it has always languished and Spain's seemingly intractable difficulties only increase. In other words, what will happen if - as seems obvious - the eurozone economies are in fact diverging, and not converging, and the divergence far from reducing is in fact increasing. The long term decline in the GDP share of French manufacturing, which is closely associated with the steady opening of a trade deficit in that country, poses special threats and problems for ECB monetary policy. This long term manufacturing decline and growing external deficit are, in my opinion, the tell tale first signs of larger structural problems to come should inappropriate monetary policy be applied too hard for too long. That is to say France is well positioned to get a distortionary bubble next time round (of the exactly the kind the newly vigilant central banks should be at pains to avoid, and indeed precisely the bubble they successfully avoided last time round) unless the ECB and the French government are very clever and very agile indeed. In essence the return of growth in France will be welcomed with open arms across the euro area, since with it comes the prospect of opening up a larger French current account deficit and this will, of course, clearly help soak up all that newly found need to export which exists elsewhere in Europ (and especially in the South and the East). But if this should be the fate which befalls an unsuspecting French citizenry, and living in a Spain which has already been processed along this very same pipeline, then all I can say is "heaven help them" for what will then follow. 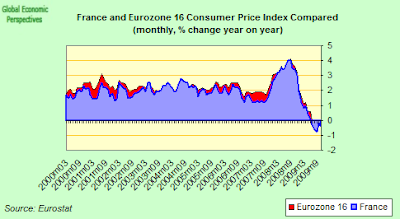 Again, all the early warning signs are there, including the prospect that France will begin to sustain above eurozone average inflation starting next year, and this will be the first time - as can be seen in the chart below - this has really happened on any sustained basis since the euro was introduced. In fact, if we look at the second chart, which is only the above one with the reverse overlay, we can see that French inflation really only peaked its head above the average in late 2003/early 2004, and the overshoot was not that substantial. This time things could well be very, very different, and the big change here is of course a direct result of what has just happened to Spain. 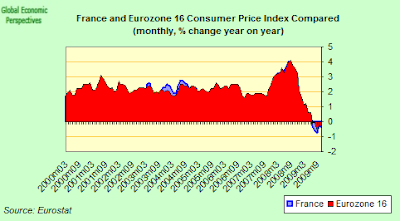 Since given that Spain has now been catapulted from a high to a low growth (or even negative growth) mode, France has been ramped up the euro league table, moving from Mr Average to Monsieur Outperform, and this will have the consequence that the ECB policy rate - which will, remember, target eurozone average inflation -will be below the one which the French economy will, in reality, need. What this will mean in practice is that there is a real danger the French inflation rate will be above the policy rate - that is that negative interest rates will be applied. 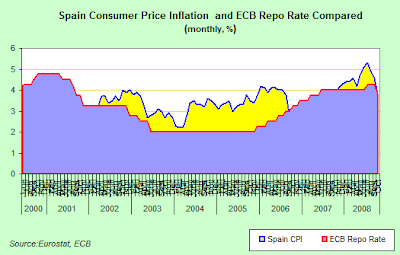 As we can see in the chart below, negative interest rates were applied to the Spanish economy between early 2002 and late 2006, and we all know what happened afterwards. With the return to growth French inflation is likely to rebound, and an annual rate of headline consumer price inflation of between 1.3% and 1.5% seems not unrealistic, which means, should the ECB not start to raise its refi rate early next year then France will be rebounding strongly under the twin tailwind effect of significant fiscal stimulus AND negative interest rates. So France is about to become the ECB's stellar pupil, but looking at what actually happened to the previous prize students (Ireland and Spain) somehow I doubt that those responsible for running things at La Banque de France and the Elysee Palace will be jumping up and down with joy at the prospect. The bottom line then is that lots of difficult decisions are now looming for European policymakers - assuming they are sharp enough to spot them at this point.